Do you ever notice that pop culture seems to come in waves? Not things like dueling movies, where Armageddon and Deep Impact both come out at the same time, or Dante's Peak and Volcano, but subtler synchronicities. Like, you'll be watching your favorite shows, and in the span of a month, three different ones in three different genres on three different networks will all have a character create a "vision board" to explain something they want. Clearly the reason for that is some outlet ran a piece about vision boards, all the various writers saw it, and it inspired them to include it in their scripts. Happenstance based on a shared pool of information. Either that or everyone in Hollywood subscribes to Ideas Monthly, the pretend magazine Neil Gaiman made up when people asked him where he got his ideas from. Other times, the introduction of an idea can be traced back to a single specific point, as is the case with the Krampus. He will put you in his sack! Krampus first appeared in America in 1993, as a boss in the CarnEvil videogame, and wasn't referenced again until the 2003 G4TV commercial that provided the rhyme up above. Sorry to both of those sources, but the world at large (aka, "America") was introduced to the Krampus via The Venture Bros. Christmas special - before that, nobody'd heard of him, and now he's a holiday staple. Movies, TV, comics... the Krampus is everywhere! And when something is everywhere, it's invariably going to be turned into a Funko POP!. When Krampus appeared on The Venture Bros., I thought he was something made up for the show. (Of course, I also thought the same thing about the Elf on the Shelf when that showed up The League, so take that with a grain of salt.) The punitive spirit who once rode side-by-side with St. Nicholas each Christmas Eve delivering terrible punishment to wicked children as Claus bestowed his gifts upon the righteous, Krampus is a typically European Christmas tradition: while American Santa is a jolly toymaker, Euro Santa is constantly battling the forces of evil and enslaving them to his will, like a Pokemon fight with decorative ornaments instead of Pokeballs. But along those lines, Santa and Krampus aren't enemies - they're playing good cop/bad cop, though in this case, bad cop will whip you with birch branches, then stuff you in a wicker basket and carry you off to hell - compared to that, a lump of coal doesn't seem so bad! 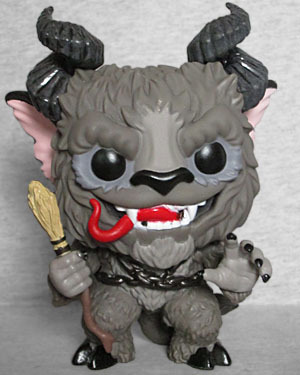 Funko's Krampus is holding a broom rather than a bundle of sticks, because even timeless winter goat-men can appreciate the drive to modernize slightly. Still, if the beatings (and hell-kidnappings) seem needlessly violent, just remember that they probably happen with about the same regularity that kids actually get coal: Krampus is more of a threat than a promise. The important thing is that Santa and Krampus aren't enemies, they're coworkers; Krampus isn't Santa's Lex Luthor, he's his Batman. Krampus is an ex-demon, not just some random Christmas monster, which is why he looks so devilish: cloven hooves, a tail, curling horns and a thick, shaggy coat perfect for those Alpine winters. 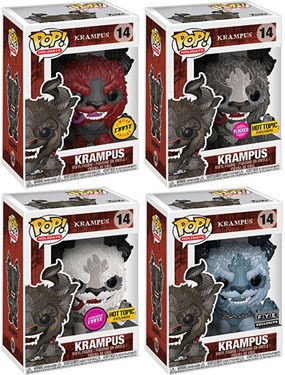 Krampus is often depicted with one hoof and one normal foot, but Funko kept him symmetrical. The sculpt on his fur makes him look like he'd be fun to pet, too. A kinder, gentler Krampus! He has a thick brows, a broad, flat nose, and the long red tongue snaking out from behind his fangs. His pointy ears are pink on the insides, and have ragged edges that look monstrous. The best feature, though, is one you can't appreciate until you open the figure. Looking at him in the box, you'll see that he's wearing chains across his chest - Krampus does traditionally wear chains, because again: he's Santa's slave. 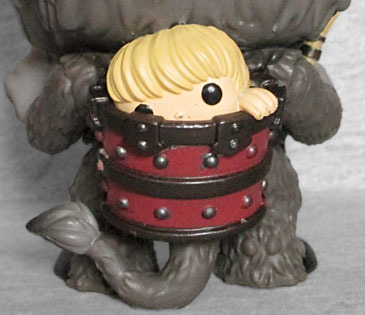 But on this toy, those chains aren't binding him. Turn him around, and you'll find a little backpack with a tiny, blonde-haired child peeking out! It's not a full figure, like the Titanfall POP!s had, just a molded shape, but it's done in the POP! style and totally fits Krampus' M.O. 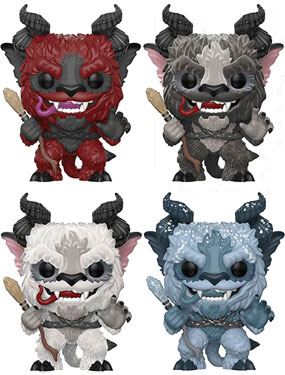 The standard Krampus POP! 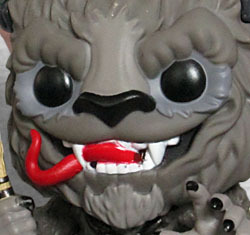 seen in this review is a brownish grey - there's also a 1:6 chase variant with red fur. Or you could get the Hot Topic exclusive, which looks like this one, but is flocked. Or maybe the Hot Topic chase, which is still flocked, but is now white. Or finally, the FYE version, done in an icy blue and covered in snow. So many Krampii to choose from! Since I don't follow POP! news that closely, I didn't know this figure was coming until I found it at Toys Я Us while dropping off Toys for Tots donations. See that? You give a little, you get a little. It's #14 under the POP! Holidays banner, meaning it's not based on any movie or TV appearances, just on the Christmas legend. There aren't a ton of Krampus toys, but this one is cool enough to find a spot in your holiday displays, even if you're not generally a fan of the POP! style.